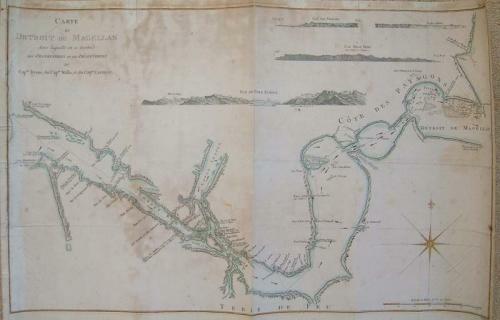 A large scale chart of the Straits of Magellan and the Patagonian shore with detailed shoreline topography. Channels, soundings, shoals, harbors and small islands are detailed. Anchorages, capes & bays. Top of chart includes 4 finely engraved landfall approach views of 1.Vue Du Port Famine 2. Cap Beau Tems 3.Cap Des Vierges 4. Rochers blanc. (white rocks). Chart includes large compass rose and depicts the discoveries of the navigators, Byron, Wallis and Carteret. In fair condition with repairs to the right margin and tape to the verso margins. Overall toning. Faults are accounted for in the price.